198 starters, 138 riders finished. 1988 winner Pedro Delgado started the first time trial 2min 54sec late, probably costing him the Tour. Greg LeMond and Laurent Fignon fought a fabulous battle that wasn't settled until LeMond won the final time trial in Paris. LeMond's 8-second final victory margin remains the closest in Tour history. Fignon said his director, Cyrille Guimard lost the Tour for Fignon by not insisting that the aerodynamic time trialing bars LeMond used were against the rules of the time. General Classification: Same as stage results. 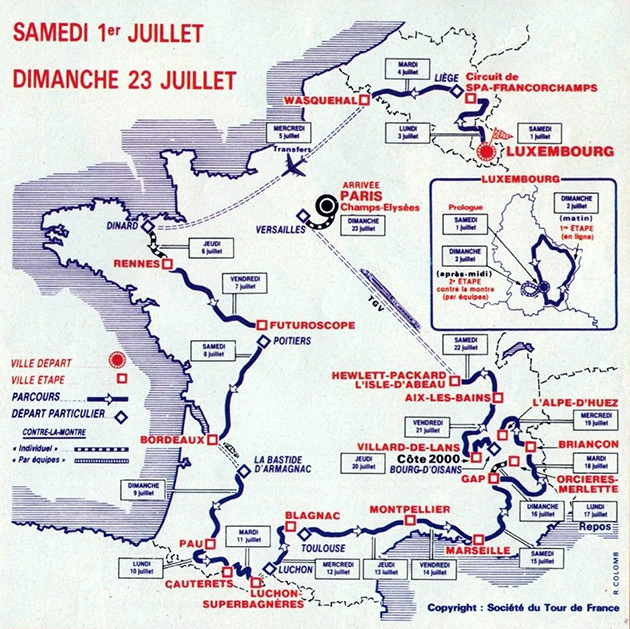 Stage 1: Sunday, July 2, Luxembourg - Luxembourg, 135.5 km. Stage 3: Monday, July 3, Luxembourg - Spa Francorchamps, 241 km. Stage 4: Tuesday, July 4, Liege - Wasquehal, 255 km. Stage 6: Friday, July 7, Rennes - Futuroscope, 259 km. Stage 7: Saturday, July 8, Poitiers - Bordeaux, 258.5 km. Stage 8: Sunday, July 9, La Bastide d'Armagnac - Pau, 157 km. Stage 9: Monday, July 10, Pau - Cauterets (Cambasque), 147 km. Major Climbs: Marie-Blanque, Aubisque, Les Borderes, Le Cambasque. Stage 10: Tuesday, July 11, Cauterets - Luchon (Superbagneres), 136 km. Major Climbs: Tourmalet, Aspin, Peyresourde, Superbagneres. Stage 11: Wednesday, July 12, Luchon - Blagnac, 158.5 km. Stage 12: Thursday, July 13, Toulouse - Montpellier, 242 km. Stage 13: Friday, July 14, Montpellier - Marseille, 179km. Stage 14: Saturday, July 15, Marseille - Gap, 240 km. Major climbs: Vars and Izoard. Major Climbs: Galibier, Croix de Fer, L'Alpe d'Huez. Stage 18: Thursday, July 20, Bourg d'Oisans - Villard de Lans, 91.5 km. Stage 19: Friday, July 21, Villard de Lans - Aix Les Bains, 125 km. Stage 20: Saturday, July 22, Aix Les Bains - L'Isle d'Abeau, 130 km. 21st and Final stage: Sunday, July 23, Versailles - Paris, 24.5 individual time trial. The Tour organization again changed Tour directors. The appointment of Jean-Marie Leblanc was one of the most important events in the history of the Tour de France. In its desperate search for income the Tour had multiplied the various prizes and classifications, each one having a sponsor and most being unimportant to all but the most dedicated racing fan. Wanting to bring clarity and therefore credibility to the Tour, Leblanc slashed the list of competitions and then raised the cost of sponsoring the remaining, now more visible ones. Under Leblanc the Tour underwent a renaissance, becoming wildly popular and financially sound. Leblanc's tenure coincided with the beginning of the trend of many of the finest Tour contenders making the Tour de France their only real goal for the season. With ever larger corporate money entering racing, the need for gigantic results to justify the big investments in teams drove more and more attention to the Tour. Leblanc's skill in running the Tour only served to magnify this tendency. Leblanc, like all Tour directors before him except Naquet-Radiguet, had been a journalist. He was the chief cycling correspondent of L’Équipe before becoming Tour boss. Moreover, Leblanc had been a pro rider with Tour racing experience, having entered and finished both the 1968 and the 1970 Tours. Both Greg LeMond and Laurent Fignon were back racing with dedication. They were in good form and finally achieving good results. LeMond's recovery from his shooting accident was long and hard. In the early season races he had done reasonably well. He was fourth in the Critérium International and sixth in the TirrenoAdriatico. LeMond had not won a race since his 1986 Tour de France victory. In the Giro he suffered like a dog finishing a lackluster thirty-ninth, almost an hour behind. It seemed that he just could not find that old magic. His wife, Kathy, flew to Italy to give him moral support. He stuck to it, refusing to give up. In the final stage, a 53.8-kilometer time trial, LeMond came in second. 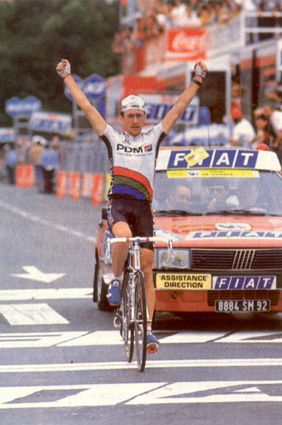 He was able to beat the overall Giro winner, Fignon, by over a minute on that stage. The strength was returning. LeMond's team however, was not a Grand Tour Team. His ADR Belgians (including Johan Museeuw) would not be able to give him the help he would need in the high mountains. He would have to race with his head all the time. Fignon, who had been unable to truly contend for a major stage race since he had surgery on his Achilles tendon in 1984, had finally found the way to win. In 1989 he had already won Milano-San Remo and the Giro d'Italia. Fignon had an outstanding team in Super U, including future Tour winner Bjarne Riis. With Pedro Delgado also in good shape and seeking redemption after his tainted 1988 victory, this would indeed be an interesting Tour. And that's just how it started out, interesting. At the Prologue, where every rider is assigned a specific start time, Delgado signed in 20 minutes early then went off to warm up. Somehow, he lost track of the time. He showed up at the start house 2 minutes, 40 seconds late. The clock had been ticking off the seconds since his start time. The clock for a rider's time trial starts with or without the rider, it is quite indifferent. Delgado roared off and did a very credible time trial, his actual time on the road being only 14 seconds slower than winner Erik Breukink. But because of his delayed start, he was now hamstrung with a deficit of almost 3 minutes at the opening of the Tour de France. Fignon and LeMond both finished at the same time, 6 seconds off Breukink's time. The shootout between the two had started at the first possible opportunity. The second stage team time trial highlighted the differences in the teams. Fignon's Super U squad won the stage, with the team finishing intact, not losing any men on the road. LeMond's ADR team came in a respectable fifth, a minute slower over the 46-kilometer course, losing 3 men along the way. Delgado's Reynolds-Banesto team finished dead last. Demoralized after his botched start to the Tour, Delgado couldn't keep up with his team. His teammates had to wait for him and nurse him to the finish. After only 2 stages Delgado was almost 10 minutes down in the overall. This was a spectacular reversal of fortune after his previous year's dominance. The next real test was the first individual time trial in stage 5. At a long 73 kilometers, it would really make a difference. Whatever emotional or morale problem Delgado may have been having in the first couple of stages, he was clearly over them now. LeMond was also coming on form. His suffering in the Giro was starting to pay off. LeMond used the new triathlon bars that narrowed the rider's frontal profile. This is standard equipment for any time trial bike today, but back then this was revolutionary stuff. Fignon should have been paying attention. LeMond wins the stage 5 time trial. Stage 9 was the first day in the Pyrenees, going from Pau to Cauterets, crossing the Marie-Blanque, the Aubisque, the Bordères and the Cambasque. Delgado's teammate, Miguel Indurain, was first over the final 3 big climbs and won the stage. Delgado was really back in action, completely revived and fighting, finishing about a minute and a half behind Indurain. LeMond and Fignon finished together, another 30 seconds back. No change to the General Classification except that Delgado continued to move up. Martin Early wins stge 8 in Pau. Stage 10 with the Tourmalet, Aspin, Peyresourde and Superbagnères made a little difference to the standings. On the final climb LeMond, feeling ever more confident, attacked. Fignon caught him and countered. LeMond tried to answer, but couldn't. Fignon managed to put 12 seconds between himself and LeMond. Fignon now had the lead by a margin of 7 seconds. Stephen Roche's knee, which had given him so much trouble over his career, flamed up again. He struggled in terrible pain over the mountains, refusing to abandon during the stage. But that was it, Roche's Tour was over. Paul Kimmage says that during that very evening while Roche was in misery in his hotel room, the management of his team was already in talks with LeMond to see if he would come over to the Fagor squad the following year. This bike racing is a hard business. 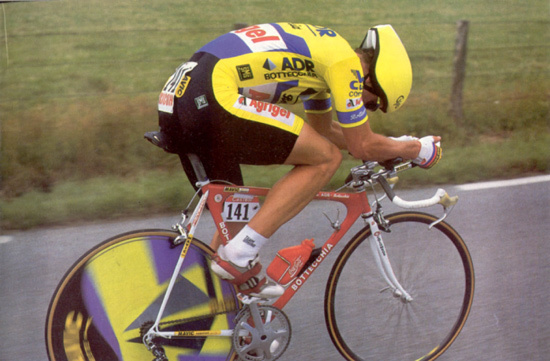 This tense, tight situation with Fignon's 7-second lead remained until the stage 15 39-kilometer individual time trial. The riders had 2 first category climbs in front of them. Steven Rooks won the stage, Delgado was fourth at 49 seconds, LeMond right behind him at 57 seconds. Fignon was tenth at 1 minute, 44 seconds. 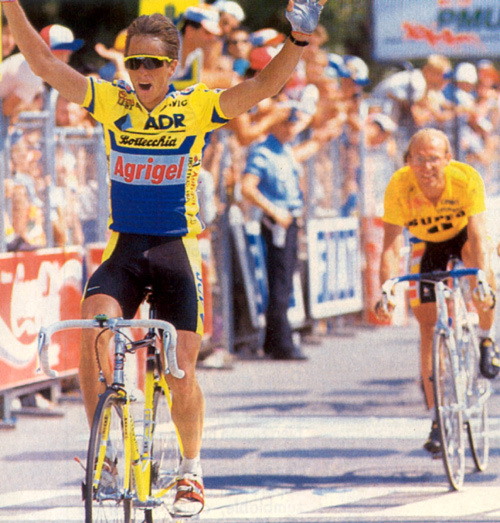 LeMond took the Yellow Jersey back with a 40-second lead over Fignon. In the next day's stage with the Izoard, LeMond was able to gain another precious 13 seconds. They say baseball is a game of inches. The 1989 Tour was a game of seconds. Each second was a pearl beyond price as the 2 athletes, both of whom were shadows of their former selves, battled with unabated intensity. Stage 17, with the Galibier, the Croix de Fer and a finish up L'Alpe d'Huez scrambled the eggs again. On the final ascent Fignon attacked and took Delgado with him. LeMond could not go with the Frenchman. LeMond gave up 1 minute, 19 seconds and the Yellow Jersey to Fignon. Fignon now had a 26 second lead over LeMond. Delgado had clawed his way to third place after being down almost 10 minutes. Fignon was finding the Alpine air to his liking. He took another 24-second chunk out of LeMond's side when he won stage 18. The gap was now 50 seconds. While publicly optimistic, LeMond is said to have privately conceded the race at this point. These men were so close, the degree of equipoise so perfect, this has to be one of the great races of history. Stage 19, with the Porte, Cucheron and Granier climbs proved it. LeMond won this stage with Fignon right with him getting the same time. Neither was giving up a single second if it could be helped. Lemond takes stage 19 at Aix les Bains just in front of Fignon. Delgado and Theunisse also got the same time that day. So, here was the General Classification going into the final stage, a 24.5-kilometer time trial from Versailles to Paris. This must be the most famous and talked about race against the clock in the history of the sport. LeMond had done wind-tunnel testing and had perfected his riding position. For the time trial he had an aerodynamic helmet and the aero bars which he had used to good effect in stage 5. The run-in to Paris was slightly downhill. LeMond decided that he didn't want to get time splits. He said that he would just go as fast as he humanly could, hoping he wouldn't blow up before the end. The idea that he could take almost a minute out of an in-form Fignon in such a short distance was not preposterous, but it was unlikely. Being in second place, LeMond went before Fignon. LeMond thumped a monster 54 x 12 gear driving it a steaming 54.545 kilometers an hour. This was the fastest time trial ever ridden in the Tour de France and remained the record for years to come. Fignon had other troubles besides LeMond. He had acquired a nasty saddle sore in stage 19. It was so bad he couldn't pedal properly. He was in real pain and unable to sleep the night before the time trial. As he had done on every other occasion going back to his second place in the 1984 Giro, Fignon shunned the niceties of aerodynamics. He didn't use tri bars or an aero helmet. He even wore a wind-dragging ponytail. His saddle sore prevented his getting a good warm-up before he started his ride. As the race leader, Fignon had the privilege of going last. With each pedal stroke he lost time. Yet, when he came on to the Champs Elysées he still had the overall lead by 2 seconds. It was in those final meters that he lost those next, oh-so-precious 10 seconds. LeMond had to watch and wait in agony to see if his roll of the dice had succeeded. The Tour was LeMond's. Fignon had lost the closest Tour in History. When Fignon learned that he had lost, he fell to ground with a moan, in tears. LeMond yelped with joy. If there is to be a winner, there must also be a loser. An aerodynamicist once calculated that if Fignon had just cut off his ponytail to reduce his drag, he would have been able to go fast enough to have won the Tour. The gents at memoire-du-cyclisme.net figured that at the speeds LeMond and Fignon were traveling in the final time trial, the 8 seconds in the final overall amounted to 82 meters, less than a football field after 3,257 kilometers. LeMond went on that fall to cap his season with his second World Road Championship.